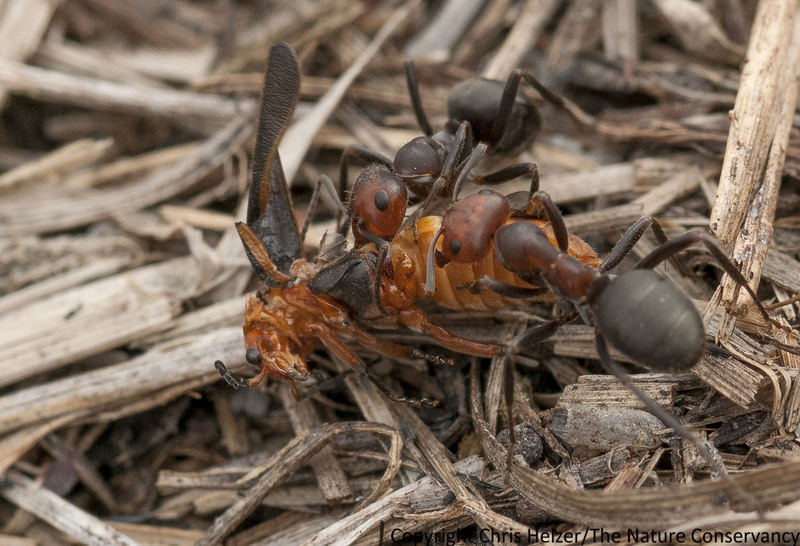 This entry was posted in Prairie Insects, Prairie Natural History, Prairie Photography and tagged ant, food, formica obscuriventris, hunting, james trager, mound-building ant, prairie, thermoregulation by Chris Helzer. Bookmark the permalink. I would love to see the picture of the mound itself in the burned prairie. How big is the mound? Yeah, I should have included that. It was about a foot tall and a foot and a half diameter. Awesome pictures Chris!! I rarely slow down long enough to actually enjoy all the small things in life, but need to start looking closer at the “bigger picture” of living things in our prairies. Great info, and speaking of ants….what do you know about them building at the base of trees and large perennials? I have several trees & a peony I planted where I see they have built a large nests. Several years ago I planted a red maple and ended up pouring vinegar on the nest, which ended the colony. I have yet to do anything about the other ones since I know it is good/natural to have them (food for birds, etc) Is this bad for the trees? Most appear to be doing ok although a horse chestnut is not doing well. Should I use vinegar again? (I do not use harmful chemicals so do not suggest them) Dig up & replant? Thanks for all of your info. It would be a good idea to get the ants identified before you do any thing. Your local extension office can help you with that. If they are carpenter ants they will attack sick trees but not healthy ones. Peony plants need ants to help the flowers open. And vinegar kills plants too. I use to control the plants in the cracks of my patio. 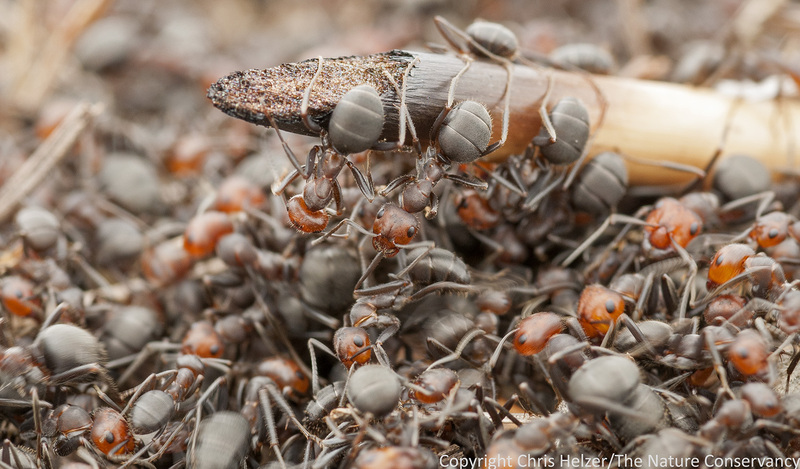 Ants are very beneficial to the soil and are one of the clean up crews of the bug world. Most likely the ants are not harming any thing and may even be helping your plants. Karen replied to this question much as I might have, except for one fine point. Peonies do attract ants to their buds, not only here, but in their native Asia and Central Europe, and everywhere else they’re planted. But the buds can open without ants. However, those big plush buds are good food for certain insects that can destroy them, and attracting ants with a small amount of sweetness on the surface of the buds engages a sort of standing army that protects the buds against these pests. I would add that horse chestnuts around the world have been having troubles due to a variety of diseases including a bleeding canker and a leaf blotching disease. I remember noting almost every horse chestnut I saw suffering from leaf blotching, on a trip to Spain and France in 2005. This tree is introduced from Europe, and escaped the diseases for a while, but the pathogens have caught up. So Mary, though the ants are causing no harm to it, you will want to watch for symptoms and check with an arborist or extension agent with knowledge of urban trees if you suspect it is sick. Finally, though it’s relatively rare for this to happen, there is one ant, the pavement ant Tetramorium caespitum (and close relatives), here in central USA that can cause damage to young, recently planted trees. Their activity mostly consists of further damaging roots that got nicked or abraded during planting and may go unnoticed. The trees usually survive if properly mulched, fed and watered. Did any of the ants take interest in the seeds you were distributing? I’m curious about the role ants play in seed distribution or predation. There is a large literature in the entomology and plant ecology journals on seed dispersal by ants. 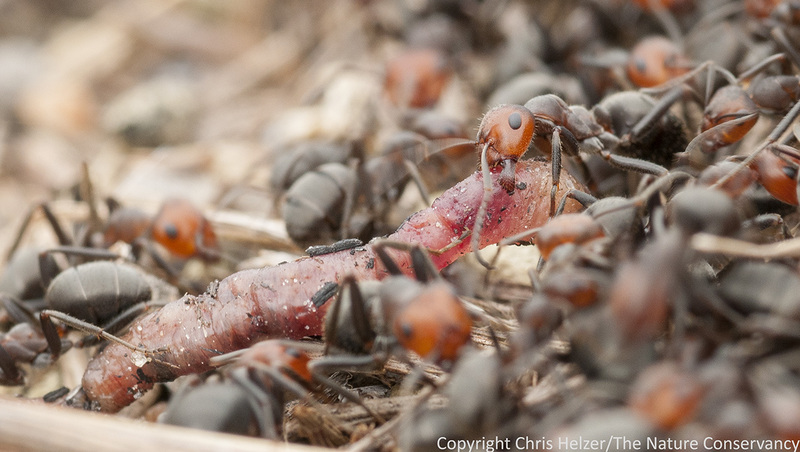 Along with wind and birds, ants around the world are a major force of seed dispersal. In arid regions, many ants actually harvest and eat seeds, but this is of minor occurrence in our region. Many plants (violets, some sedges, Dutchman’s breetches, trout lilies are examples in our flora) have edible appendages on their seeds that induce ants to harvest them. The ants eat the soft, juicy part and leave the healthy seed intact, and even do the seed the favor of burying it with their trash or latrine waste, thus planting it with fertilizer. 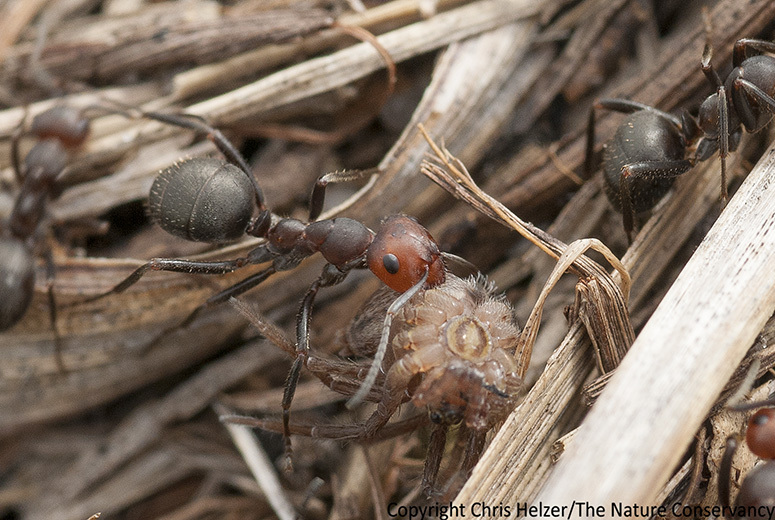 Most prairie plant seeds are not much dispersed by ants, but the mound-building Formica species such the ones in this post do gather seeds, especially grass and fluffy seeds, for building material for their nests. The ants do not eat them, and because the twig and leaf piles of the nest are very well drained and not very suitable for germinating the seeds, the seeds in the mound end up entering the “seed bank” of the prairie. When the ant colony dies out or for some other reason abandons the mound, and the piled up organic matter begins to be moistened and break down, seeds may then germinate, complete with compost/mulch provided by the decomposing material around them to help them along. This is fascinating, James. Thank you! I appreciate all information you provide on insects. I certainly have plenty of ants in the loamy sand environment around my urban house. I try to live in harmony with them, knowing what beneficial earth-movers they are, but they undermine concrete and even buildings, given enough time. I trust they’ll be around a lot longer than my worries. The funny thing is the other day I saw an ant that looks just like this one with a mound matching the description and I had no idea of the identity. It is just brilliant that ants help store thermal energy in the ground. I had never even considered their role in temperature moderation in the environment. This species and some others that look like (just like it, to most people other than us ant-geeks) it also occur in your part of the prairie world, James McGee. James T – any help with Laura’s question about seed dispersal or Mary’s question about the impact of ants on her trees? I have answers but don’t want to overextend my knowledge base.